I am a fan of super­hero comics. After read­ing about talk­ing ducks, pre­co­cious teens at Riverdale High, and an equal­ly pre­co­cious rich kid, I want­ed some­thing with a real sto­ry, not a sit­u­a­tion. I wasn’t allowed to buy com­ic books, so I had to rely on the kind­ness of cousins. What­ev­er I could scrounge up in their rooms was irre­sistible for me. When I dis­cov­ered Bat­man and Super­man at a teen cousin’s house, I had found the sto­ries to build my dreams on. Sad­ly, it was always a lone issue. I nev­er knew what hap­pened next. That wasn’t all bad. I had a lot of fun mak­ing up my own sto­ries, cul­mi­nat­ing in an excit­ing out­come. It wasn’t until I was an adult and graph­ic nov­els became com­mon that I was able to find the begin­ning, mid­dle, and end of super­hero sto­ries. Today I read a lot of comics, mak­ing up for those lost years. Some super­heroes have become less than admirable in our cur­rent taste for the anti-hero. They weary me. 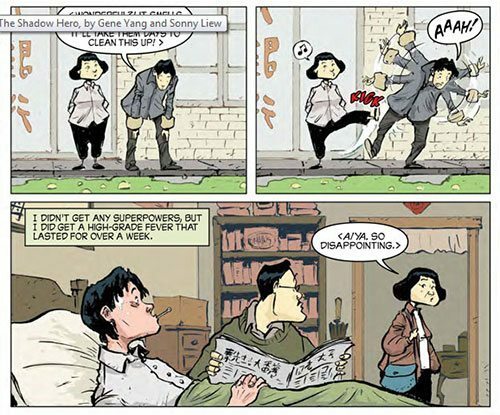 Thank good­ness for Gene Luen Yang , Son­ny Liew, and The Shad­ow Hero. They’ve cre­at­ed a fresh, fas­ci­nat­ing, and acces­si­ble char­ac­ter in Hank Chu, the son of a Chi­nese immi­grant who owns a gro­cery store and a moth­er who has big ambi­tions for her son … she wants him to be a super­hero. She maneu­vers and manip­u­lates, even risk­ing Hank’s life, to make him into some­thing he doesn’t want to be. In homage to a com­ic series, The Green Tur­tle, orig­i­nal­ly pub­lished in the ‘40s, Hank Chu is inhab­it­ed by one of the four spir­its pro­tect­ing Chi­na, a tur­tle. What might seem con­ve­nient to the sto­ry­line in the hands of anoth­er writer becomes a sol­id, sat­is­fy­ing char­ac­ter­is­tic with Yang’s writ­ing. The vil­lains, pro­tec­tion rack­e­teers, are mul­ti-lay­ered. Hank’s roman­tic inter­est is shad­owy, but smart and forth­right. The sto­ry sails along, com­pelling the page turn. As for Son­ny Liew’s art, I love his crisp line, expres­sive faces, and a style that eas­i­ly relays motion. The palette in brown, rust, mauve, and green is mut­ed. It suits the atmos­phere of 1930s San Incen­dio, a city big enough to have a Chi­na­town. Even the Tur­tle, Hank’s shad­ow, is expres­sive when he con­fers with Hank in moments of great need. This book is a win­ner. Hand it con­fi­dent­ly to any read­er who has a pen­chant for hero­ic deeds … or some­one you sus­pect will wait breath­less­ly for the Shad­ow Hero’s next adven­ture. The book will be released as a paper­back on July 15, 2014. You can pur­chase dig­i­tal ver­sions now wher­ev­er your favorite e-books are sold.